As America’s leading energy producer, Texas sets the pace for our nation’s efforts to become energy independent. Today, Secretary Perry and I were able to sit down with local leaders to have a productive and free-flowing discussion on regulations impacting the energy industry and how emerging markets, like China and India, will impact the U.S. I look forward to continuing to work closely with the Secretary and our energy producers to support our oil, gas, and alternative energy fields and advance efforts to ensure our continued leadership and economic security. 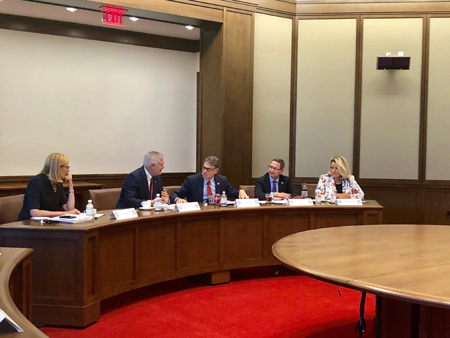 Congressman Sessions and Secretary Perry were joined by Ken Hersh, CEO, George W. Bush Presidential Center; Holly Kuzmich, Executive Director, George W. Bush Institute; Glenn Adams, CEO, Adexco Production; George Damiris, CEO, HollyFrontier Corp.; Hon. Jeanne L. Phillips, Senior Vice President, Hunt Consolidated, Inc.; David Martineau, Martineau Petroleum, Inc.; Joe Foran, CEO, Matador Resources; David Crockett, SVP, Stonetex Oil Co.; Mari Ruckel, VP, Texas Oil & Gas Association; Ed Longanecker, President, Texas Independent Producers & Royalty Owners Association; Curt Morgan, CEO, Vistra Energy; Blake Barfield, HollyFrontier; Sano Blocker, Vistra Energy.